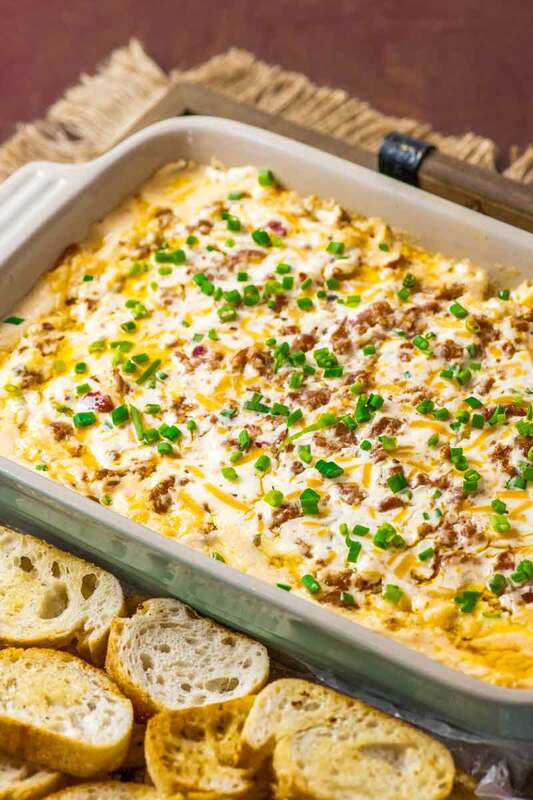 This Louisiana-inspired Boudin dip is baked hot and bubbly with spicy Boudin Cajun sausage, a mix of cheeses, and sour cream. Perfect for parties or game day! 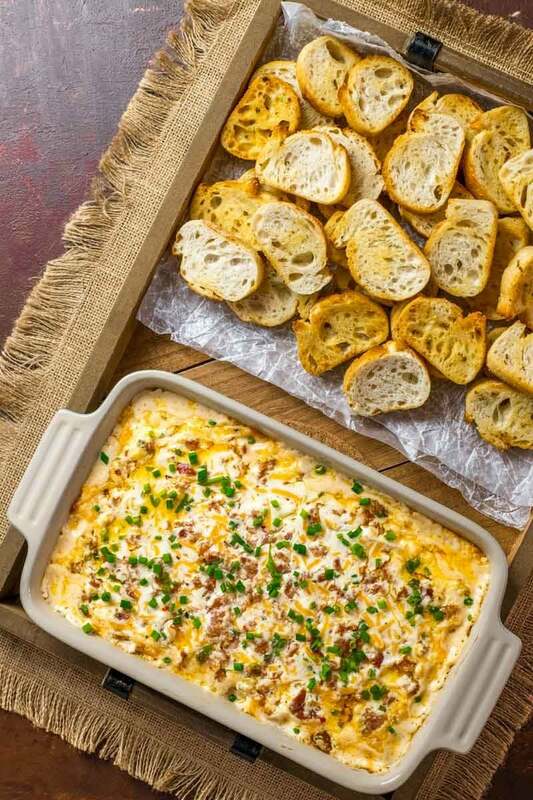 No party is complete without a cheesy dip for the guests, and this Louisiana-inspired Boudin dip is sure to be a crowd-pleaser! 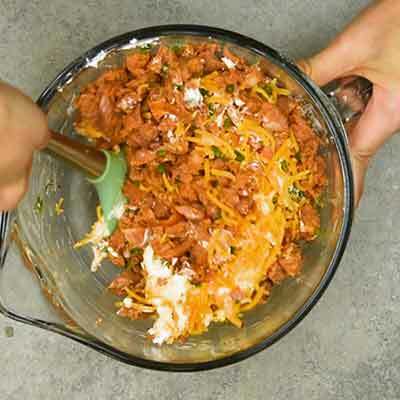 Boudin dip is a Louisiana-inspired recipe with Boudin Cajun sausage as the key ingredient. The casing is removed before the sausage is crumbled and mixed with cream cheese, sour cream, and cheddar cheese. It’s then baked in a dish to hot and bubbly perfection. Boudin is widely used in Cajun cooking, but finding the “boudin” label on pre-packaged sausage might be difficult if you live outside of Louisana. If that’s the case for you, then you can either try your hand at making the sausage at home (see: Homemade Cajun Boudin Sausage) or you can substitute with any “Cajun” sausage. You could also use regular sausage and add 1-2 teaspoons (or to taste) of Cajun or Boudin seasoning. This dip does have a bit of a kick, but the sour cream goes a long way in cooling down the taste. For example, I was able to enjoy this dip and I’m usually pretty sensitive to black pepper, let alone anything on the Cajun cuisine spectrum. Or, if you’d like the dip to be spicier, you could add 1-2 teaspoons (or to taste) of Cajun or Boudin seasoning before baking. What can you serve with a party dip? When it comes to party dips, there are so many fun options for dipping! I tend to like to serve cheesy dips like this with toasted buttery bread, but you can also serve it with different types of crackers and snacks. Since this dip will be served warm, that should give you another 30-60 minutes before needing to keep track of the dip. So, in total, this dip can be left out for an absolute maximum of three hours, depending on the temperature of the room. However, be sure to still check the dip every now and then and use your best judgment. Once you pass the recommended time, you can heat it up in the oven again or you can store it in the refrigerator or freezer as directed above. For best results, I’d recommend using a warming tray so that this Boudin Cajun dip stays warm and above the “danger zone” temperature. Can you make Boudin dip in advance? Once assembled, this dip can be stored in the refrigerator for three to five days, depending on the freshness of the sausage used. When ready to bake, let the dip warm up on the counter for about 30 minutes, then bake per the recipe instructions. Can you freeze Boudin dip? Step 1 – Prepare the sausage by removing the casing and crumbling it into small pieces. Pro tip – I like to use my hands for this step so I can remove any undesirable pieces. Step 2 – In a large bowl, mix together the cream cheese and sour cream until nice and smooth. 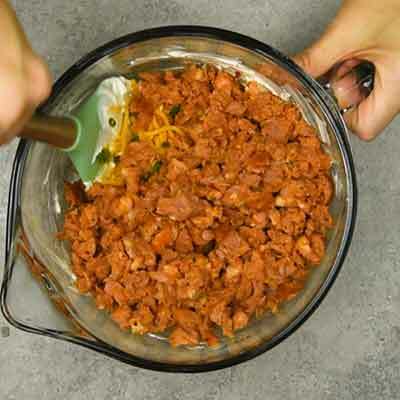 Step 3 – Toss in the cheddar cheese, green onion, and crumbled sausage with the cream cheese mixture, then use a spatula to gently mix them together. Step 4 – Pour the dip into a baking dish, then spread it out into a nice, even layer. Note: Depending on your region or access, the "boudin" or "cajun" sauage you're able to find could be raw or pre-cooked. Check the package directions to ensure which type you have. If you have cooked sausage, you can move on to the next step (there's no need to cook it again first). If you have raw sausage, it should be cooked before moving forward. If you're unsure how to cook sausage, check out this guide . Preheat oven to 350 degrees F. Spray a 9x5 baking dish (or similar size - should hold 1 quart) with cooking spray, then set aside. Prepare sausage by removing casing and crumbling into small pieces (should be 1/2 inch or less in size). Tip: for best results, use your hands to crumble sausage; this way you can feel any remaining pieces of casing or other undesirable parts and remove them. Once crumbled, set sausage aside. Using a stand mixer (or a hand mixer + large bowl), mix cream cheese and sour cream on medium speed until smooth, about 5 to 7 minutes. Add cheddar cheese, 2 tablespoons of green onion, and sausage to bowl, then use a spatula to thoroughly mix all ingredients together. Pour dip mixture into prepared baking dish, spreading out and pressing it into an even layer. Bake dip for 30 minutes or until cheese is melted and bubbly. Serve immediately with remaining 2 tablespoons of green onion garnished on top. Is the sausage cooked first before adding other ingredients? Great recipe. I’ll bet smoked boudin would be great too. Love this! This will be perfect for our Easter family dinner! Thank you! Perfect for Mardi Gras! And so irresistible!!! Nothing beats a good cheesy dip, and this one looks like a real winner! I’ve never heard of boudin dip before and now I can’t wait to make it! This Dip looks so comforting! So good! Would Andouille sausage work in place of the boudin sausage?